Photo: Vice-Chairman of Summit Group Jafer Ummeed Khan showing the Summit Narayanganj Power Plant - Unit I & II to His Excellency Dr Ashraf Shikhaliyev, Ambassador, Embassy of the Republic of Azerbaijan and Deputy Chief of Mission Babak Ahmadov. 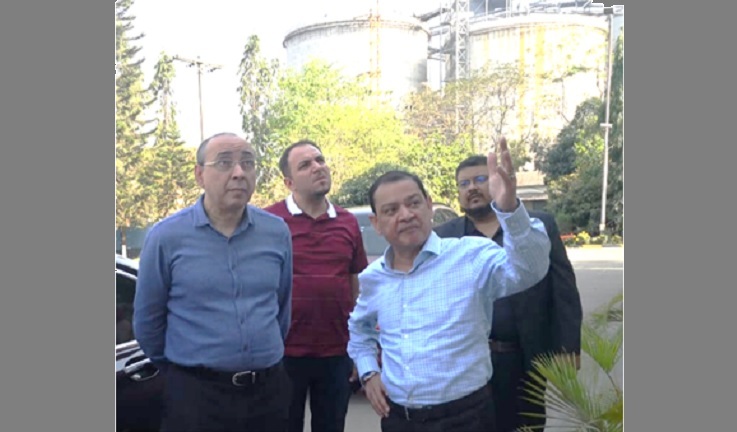 Ambassador of Azerbaizan to Bangladesh, India, Bhutan, Sri Lanka and Nepal Dr Ashraf Shikhaliyev along with Deputy Chief of Mission Babak Ahmadov visited the Summit Narayanganj Power Plant- Unit I & II (165 MW) on March 09, 2019. The Ambassador, Embassy of the Republic of Azerbaijan, paid the visit at the invitation of the Vice-Chairman of Summit Group Jafer Ummeed Khan. Azerbaijan and Bangladesh share a warm bilateral relationship. During the independence of Azerbaijan in 1991, Bangladesh recognized it at early stage. Bangladesh exports pharmaceuticals products to Azerbaijan.